This is a review of Smok'd Out Candle Company wax melts. Smok'd Out Candle Company is a new business based in Seaside, Oregon. Emily, the company owner, made her first sale on February 10, 2019. Emily is a full-time college student studying for a degree in business. She has 3 young daughters and a husband at home, and her family has been the driving force behind Smok'd Out Candle Co. Making candles, wax melts and lotions has been a way for Emily to create moments with her daughters and spend more time at home taking care of them. There is a story behind each and every item she makes. Emily is determined not only to create quality products, but to help others do something to better their lives as well. She has an "if I can, then you can too" mentality, and as a person, mother, woman and entrepreneur, she wants to show people that they can achieve their dreams! Smok'd Out Candle Company's wax melts are 100% soy, which concerned me because often wax melts made with soy don't throw well. But I was pleasantly surprised that these threw quite well, and they smelled great too! And I like that she puts the scent notes right on the label! At the time of this review, these were the only available scents. However, more scents have been added, and even more are in the works. 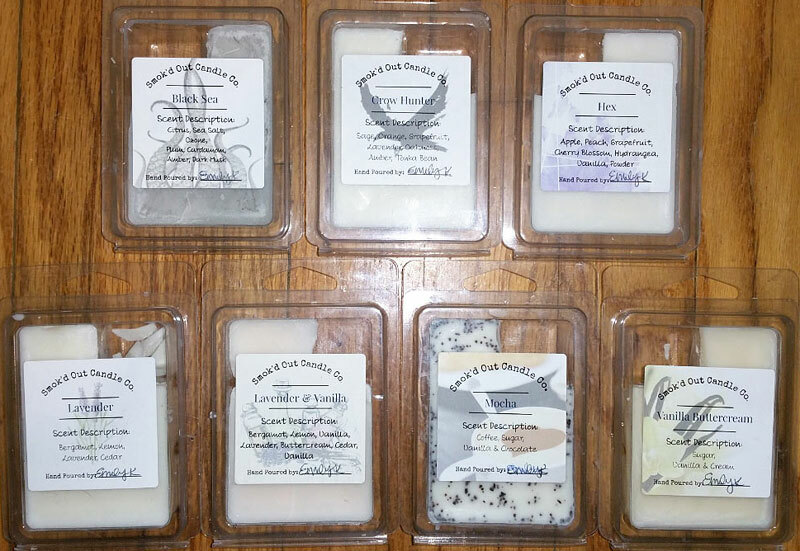 Currently Smok'd Out Candle products can be purchased from her Facebook page, or just call Emily at 360-442-6782. She is working on getting a website up and running. A nice fresh rich men's cologne scent. I don't smell plum or any fruity notes, and I'm not sure what cardamom smells like. This smells like a combination of fresh sweet men's cologne and lavender. I really like it! Melted, there's a bit of a lemon note. Looking at the notes, I don't smell sage (which is a savory herbal scent), orange, grapefruit (although that might be the lemony note I detect), or tonka bean (vanilla). This is a Victoria's Secret Love Spell dupe. Most people love this scent, but I don't. It smells like bland grapefruit scented paper to me! I don't smell ANY of the notes shown for this scent! Perfect lavender scent. Very authentic, but also with a hint of sweetness. I just smell the lavender, no bergamot (which would give it a cologney note) or lemon. I don't think I smell the cedar either, but maybe that's the slight sweetness in the scent. This is a combination of their Lavender and Vanilla scents. It's a great combination, and has equal amounts of lavender and vanilla buttercream. Sometimes I smell more lavender, sometimes more vanilla. This is a strong, bitter, black coffee scent that reminds me of Swan Creek Candle Roasted Espresso. There may be a tiny bit of a creamy note, but on cold sniff it's not sweet and I don't smell chocolate. Melted, however, I do notice a smidgen of sweetness. It's a fantastic scent, very authentic, and really smells like I'm brewing black coffee! This is a standard vanilla buttercream scent that I smell a lot, probably uses the same scented oil manufacturer. It's a fake scent but still smells quite nice.